Extended top and bottom flaps allow these strong boxes to stack on all sides! 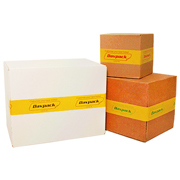 Strong cardboard boxes with fold over flaps for large items and triple strength protection top and bottom. 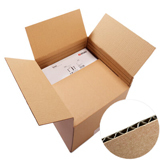 Made from rigid corrugated board with a kraft paper finish, these overlapping flap boxes come with extra large flaps to provide triple layer protection on the top and on the base. Available from stock for immediate dispatch. The benefit of this structure is in the way it's built. Because there are three overlapping flaps on either end, there's reinforced strength and added security. So when the box and its contents are lifted, the added triple layer protection adds strength to any glue, tape or strapping being used, providing reduction in premature opening or splitting whilst also giving added strength. Another benefit with triple layer protection is extra protection where vulnerable. 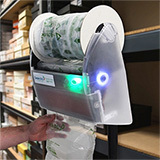 For instance, placing the box with its contents endwise on any hard surfaces, will mean that there's reduced risk in damage. Delivered in flat packs for easy convenient storage. Give our Sales team a call on 01332 821200 for further details, or order online now! You can now upload a logo or add a thank you message around a parcel. No MOQ! 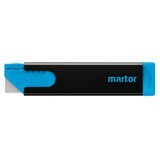 Martor Handy - the retractable safety knife for all cutting jobs!